1. Cloth or clothing gracefully arranged in loose folds. 2. A piece or pieces of heavy fabric hanging straight in loose folds, used as a curtain. So I guess a drape is a type of curtain. Having drapes sounds so formal but curtain seems too casual. Window treatment is too vague. Well, no matter what I call them they are new, gorgeous, and another easy diy project. It took me months of searching websites and fabric stores to find this fabric but once I found it I knew it was perfect for my kitchen. I wanted a colorful pattern to compliment the new wall color and white cabinets and this one delivers. The fabric is Lucy Eden by Richloom. I bought mine at fabric.com. It's kinda pricey at $23 a yard but after $35 you get free shipping and I used a promo code to get 13% off. I bought 8 yards total so with tax it came to $175. This gave me enough fabric for 2 panels and I have about 2 yards left over. 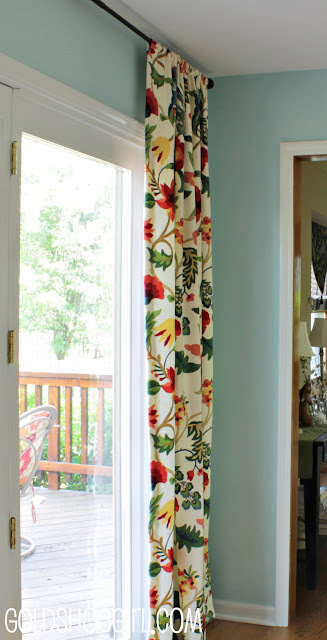 I am either going to make a curtain for the window over the sink or some pillows for the chairs in the kitchen. So really each panel cost me about $65. I know this still seems like a lot of money but compare that to the Mantadia panels at anthropologie that are $250 each. I feel great that I saved $325 but still got the look I wanted. I am just in love with this fabric. It's not real crewelwork but it has the look especially from a distance. I made these in a few hours one afternoon. I use the same basic method for making all my curtains. Small disclaimer: I am not a professional seamstress and this is just my way of doing this. You can find hundreds of other tutorials if you do a quick google search. 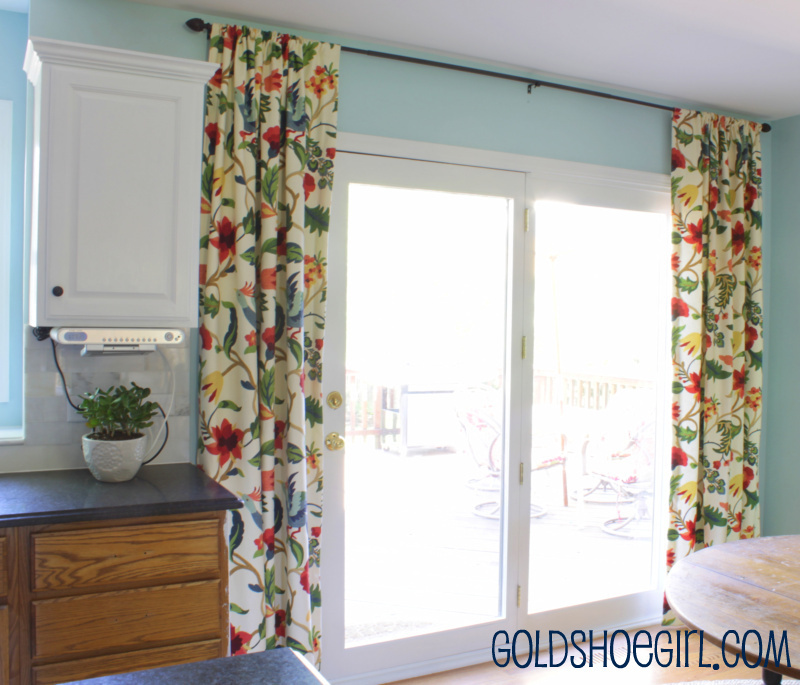 My goal is to give you a quick and easy way to make simple curtain panels. 1. Calculate length and width. You can see how I make my calculations below. Whenever I do width I try to just work with the width that the fabric comes in so I don't have to make extra cuts or seams. Normally you want your fabric width to be at least double the actual width of your window. However, in this case I decided that these were going to be decorative panels and I wasn't going to make them so they would completely cover the doors when closed. The fabric came in a 54" width so I just made a 2 inch hem on the side of the panel that would be in the middle of the door and a 1 inch hem on the outside of the panel which gave me a finished width of 51 inches. 2. Cut fabric. I usually end up doing this on the floor because of how long the fabric ends up. Just make sure to follow the whole measure twice cut once cliche because it would totally stink to cut your expensive fabric wrong. 3. Iron top and bottom hems to appropriate length. In my case I used the iron to make a 3 inch fold on both the top and bottom. I only iron the top and bottom to make sure I get straight hems. For my sides I just approximate using my ruler with the fabric in the machine. On the sides you cannot tell if you get off by a little bit but it would show if you got really crooked on the top or bottom. 4. On the long sides of your panel fold the raw edge under a half inch and then under again to your desired hem width. You can choose to pin these folds the length of the panel or I just fold as I sew. Then just sew a nice straight line down the panel. quick tip: Make sure to sew your side hems first or else you will end up sewing your rod pocket closed. 5. For the rod pocket you want to fold the cut or raw edge up a half inch. Pin this down after folding the fabric to your pre-ironed 3 inch fold mark. Then sew a straight line to sew down the 3 layers you just created. This makes your pocket. Do the same steps to make your bottom hem. At this point you can iron your finished panels and hang them up. Or if you are like me and you get too excited you can just hang them up without ironing:). There is one other thing to notice in these pictures. Yes, I know you can't believe it but I did finish painting one whole cabinet!!! It looks better than I imagined. The white makes everything else in the kitchen look so good. 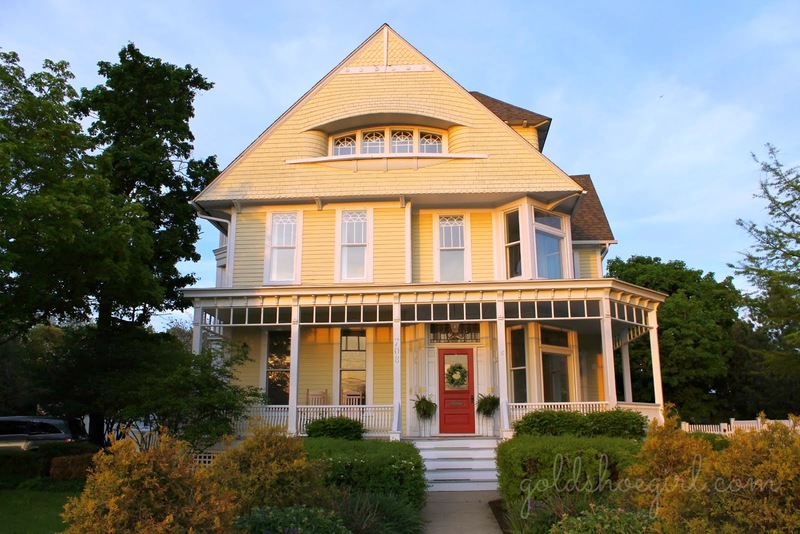 You can check out my original kitchen and the island redo if you're interested. Here's another shot of the curtain next to the bottom cabinet. The white cabinet even makes the floor look better. And just when you had enough here's a side view of the panel. My pictures do not do justice to the beautiful fabric so you'll just have to trust me that it is really, really lovely in person. I finished them about a week ago and I still can't stop gushing. So what do you think? I want to hear about your latest gush-worthy item. 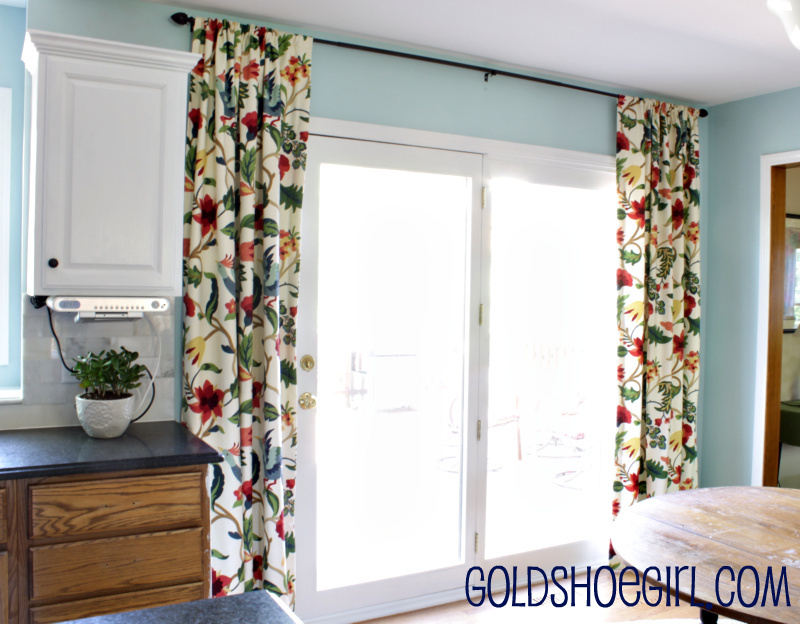 And do you think I should make a matching curtain for over the kitchen window or would that be too much of a good thing? 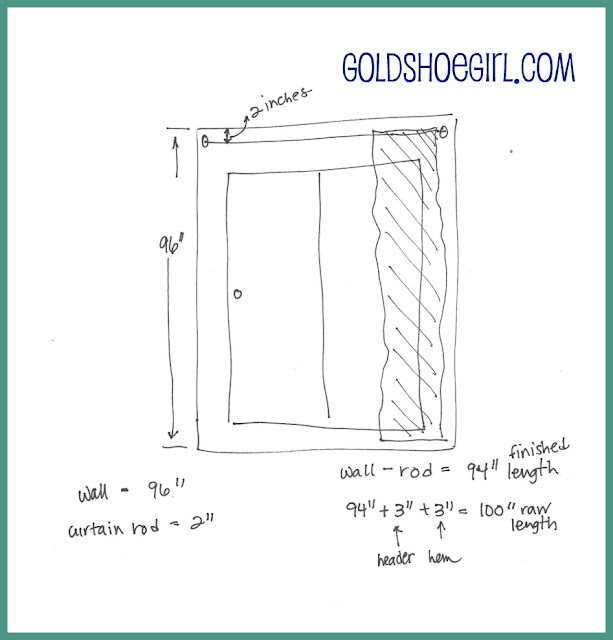 or Subscribe to Gold Shoe Girl by Email. These are so pretty!!! thanks for linking up, I will be featuring it next week, feel free to grab a button. Thanks Kristin!! I love your blog I can't wait until next week!!! I've made pillows out of that fabric and never even thought of that pattern for curtains, but your curtains are stunning. 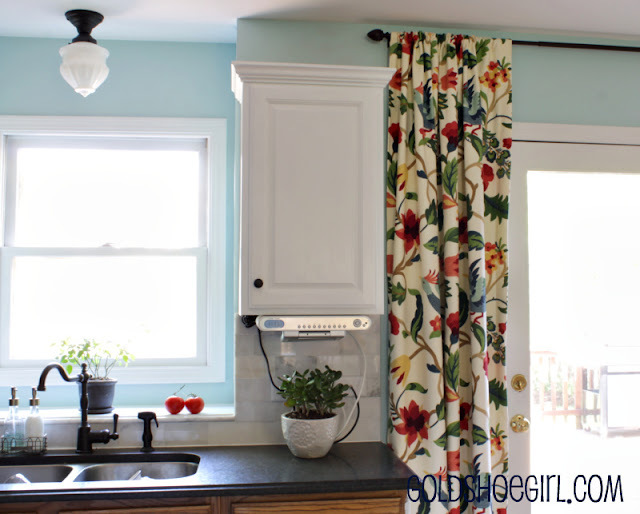 They bring so much life and color and fun, but in a classic way, to your kitchen ... but modern at the same time because it is a very fresh application for that print. Bet the curtains hang well too because of the weight of the fabric and the great weave textures. Great job! Thanks for the compliment. You are right about the weight of the fabric and I should have mentioned that it is a nice heavy quality cotton. The colors are really vibrant and fun for any project. Absolutely lovely fabric! Great job...totally looks professional. P.S. I'm posting as an 'anon' because I'm trying to see how it works. Just started a blog and I'm not sure I want to have that as an option. Do you get a lot of not so great comments? My name is Doreen and I'm at househoneys.com In a few weeks I'll have some curtains/drapes to show too. Beautiful fabric. They really pop against the wall color! Great job! You rock! 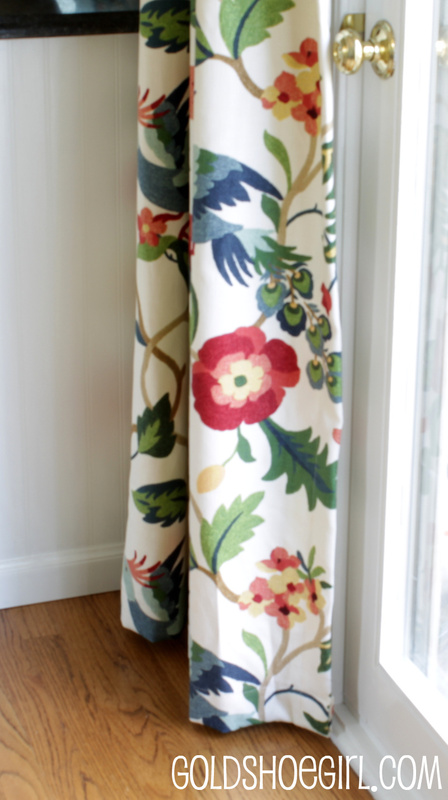 I saw the Anthrpologie crewelwork curtains and fell in love with the pattern and colors, then about fell over at the price tag! I was hoping to find something similar, but cheaper. 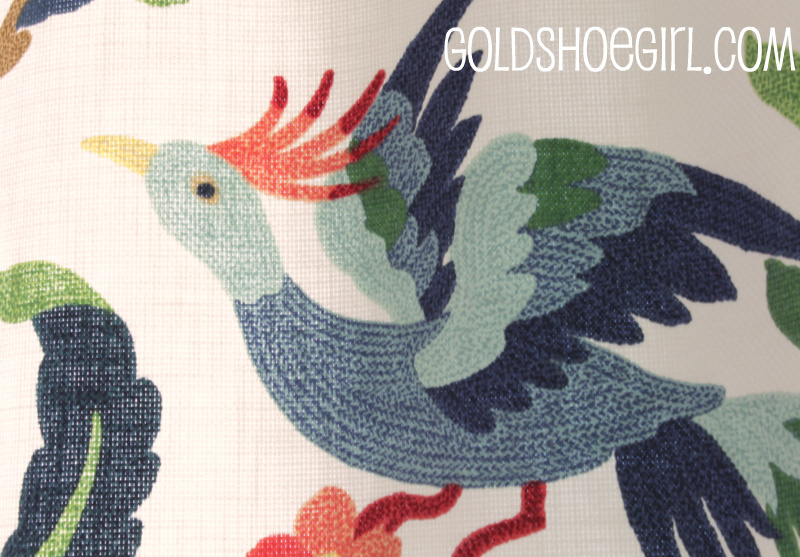 I did not expect to find the same pattern, but as a print - so I am super excited to find your website. Thanks for the inspiration, I think I will try making them myself, too. Your curtains are beautiful! I ADORE this fabric so much that I bought 2 yards of it as soon as I saw it (I believe on http://littlegreennotebook.blogspot.com/), and got it at $12.99/yd, which now seems too good to be true. 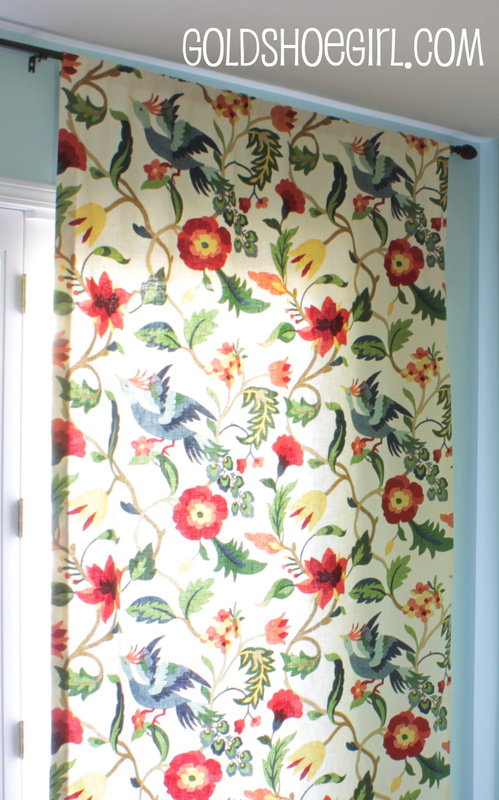 My husband and I just hung it up as a test curtain panel in our dining room, and are now ordering another 2 yards so we can make them full curtains. We're putting a band of dark red fabric at the bottom, both to increase length and for styling. It's so vibrant, we can't wait! I love these curtains and am planning to make them for my bedroom! You're an inspiration! I don't do much sewing, but know how to sew a straight line. This may seem like a dumb question, but I don't want to make a mistake when I order the fabric. Does the pattern repeat on the horizontal or the vertical? I don't think you have a seem in your curtains half way through...but want to make sure. Thanks for your help! The pattern repeated vertically. I purposely ordered the fabric knowing each panel would only be as wide as the width of the fabric. There are no seams down the panels. Keep in mind that the 54" width did not cover my doors when stretched out - but I knew it wouldn't. These were made purely to look pretty hanging not for actual use for like peeping toms or nosy neighbors or such:). Good luck with your project!